Hot Wheels Ai Track Set Just $24.99! Down From $150! Shipped! 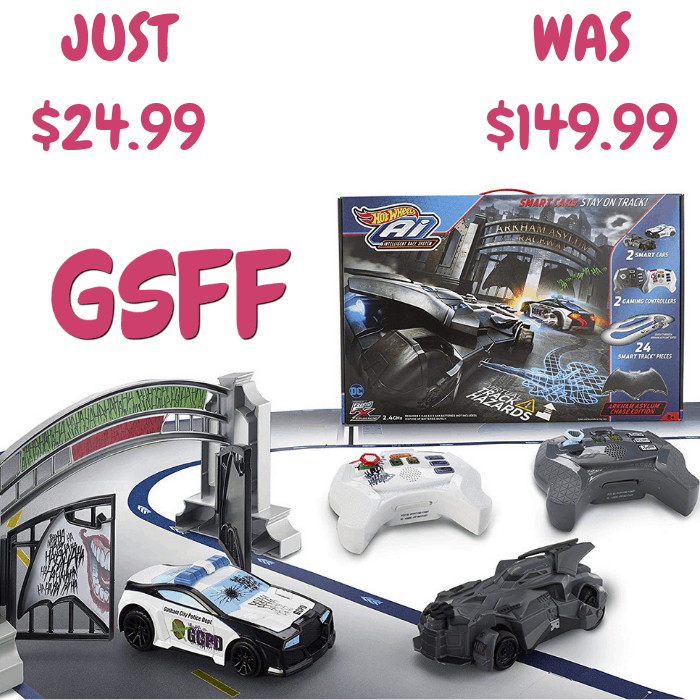 You are here: Home / Great Deals / Amazon Deals / Hot Wheels Ai Track Set Just $24.99! Down From $150! Shipped! Amazon has his Hot Wheels Ai Track Set on sale for just $24.99 down from $149.99 PLUS FREE shipping! Take the imaginative storytelling fun to epic new levels with the Hot Wheels Ai Intelligent Racing System Arkham Asylum Chase Edition! Kids can play as Batman or his devious archenemy, The Joker, and authentic sounds from the characters really make the thrilling adventures come to life. Challenge players’ skills as they journey from safe routes in Gotham City to insane zigzagging roads in The Joker territory. Crank up the competition as racers blast through the Arkham Asylum raceway gate and send the swinging doors crashing back into their opponent! Then drive their problem solving as players battle their way to victory — to save Gotham City or defeat the Caped Crusader!